When I wrote about celebrating our 125th earlier this year, I shared my perspective on the importance of understanding and appreciating our past, enjoying our present, and being optimistic about our future. When I wrote those words, I knew that the year would be fast-paced and enjoyable, but I had no idea that I’d be able to experience all three in one month. Although things didn’t happen in this order, I want to begin with the School’s incredible future. With the announcement that Michael Turner will succeed me and become Shipley’s tenth Head of School, I find myself incredibly excited about Shipley’s future. Although I do not know Michael on a personal level, I have known him from afar and have been incredibly impressed by the good work he has done wherever he has been, including Germantown Academy, Roxbury Latin, St. Christopher’s, and St. Michael’s. Bright, talented, and committed, Michael prioritizes kids and community, and he believes in our mission. I have no doubt that he will provide the leadership; develop the relationships with constituents; partner with students, parents, alumni, and colleagues; ask the questions; and do the things necessary to help us become a stronger and better school. I know you will join me in welcoming him, his wife Meredith, and their children—Maggie, Fran, and August—to the community. I look forward to spending time with Michael in the months to come as we work toward a successful transition. I am confident that the anecdotes I am about to share about the past and present will reinforce Michael and his family’s decision to come to Shipley. During the past month, I have had the privilege to enjoy alumni events in Chicago, San Francisco, and Los Angeles and reflect on Shipley’s history. The events were emotional and enjoyable as I listened to people reminisce about their times at Shipley. It was heartwarming to have alums who graduated anywhere from five to fifty-plus years ago engaging with one another and sharing their experiences from when they were at Shipley. When they spoke about their time here, their memories were similar in nature. They shared the importance of being known, supported, and challenged by teachers and coaches. They loved that they were appreciated for the people they were. And, they were grateful to have had their lives shaped in ways that they could not imagine or understand when they were here. As a result of those events, I’ve had a number of emails and letters from alums who have shared thoughts about the impact Shipley has had on them and on the way they perceive the School to have grown. The story that Talia Datskovsky ’09 shared particularly captured their essence. It was heartwarming to hear such positive feedback about people’s experiences at Shipley and to know that they feel as good as they do about their time here. Moreover, in Talia’s case, it was (is) especially heartwarming to see the three major threads of our mission – educational excellence, love of learning, and compassionate participation in the world – present in what she says and does. It’s clear that she lives our motto: Courage for the Deed; Grace for the Doing. Our alums’ comments and experiences make me grateful to be part of a community that has celebrated students as individuals since its inception and has remained committed to the same mission for many generations. While it’s important for schools to continue to grow, they must know what to hold onto and what to change. In this instance, the commitment to excellence, the belief in individuals, and the desire to have students make a difference in the world is something that should and always will be part of Shipley. This month, I also had the privilege to attend the fourth grade trip to Lancaster Amish country. This trip is one that the School has done for the past thirty years. It’s also one that I’ve had the privilege to go on more than twenty times. Our students, parents, and teachers enjoyed the experience of a different culture by visiting produce and steer auctions, a one-room schoolhouse (whose students once again defeated us handily in baseball), and a farm of the Stoltzfus family, who are friends of retired colleague Linda van Horn, who grew up in Lancaster. As the experience touched our kids, I had to come to grips with the emotions I felt when I realized this is the last time I would make that trip. It’s in experiences like this that I realize that as important as the academic program is, it's often the things that go with it—such as field trips and other co-curricular activities—that make a difference in people's lives. I can’t help but think that as we all develop more understanding of other communities such as the Amish, it helps prepare us to better listen to, appreciate, and understand people from different backgrounds that we will meet in the years to come. We are very proud of Gyasi and his work and persistence. When he took on the topic as a fifth grader, no one anticipated that it would lead to such startling success. To his credit and others who took the time to work with him, his dream of creating a better world came to fruition. For me, the work demonstrates the power and potential of the Think Care Act Fair, both for our fifth graders who go through it and for the broader community. In our desire to continue to put past and present into perspective, to get better, and to help Michael with the transition process, all constituents will receive a survey from Lookout Management in November. Your feedback will be important, and we look forward to reviewing your responses and sharing the results. This is the fifth time we will have gone through this process. Each time we have done it, it has given us vital information to help us shape the school we are. I thank you in advance for taking the time to give us your feedback. And, in our effort to continue to do what we do better as parents, I encourage you to join us on Thursday, November 15 from 8:30-9:30 a.m. in the Grey Box to hear from Dr. Rob Evans, psychologist and Executive Director of The Human Relations Service, in Wellesley, Mass. He will speak about parenting dilemmas and will offer concrete suggestions to help parents/guardians raise competent, caring children, and on how to reduce their children’s stress—and their own. Rob, who is the author of a number of books, including: Seven Secrets of The Savvy School Leader, Family Matters: How Schools Can Cope with The Crisis in Childrearing, and The Human Side of School Change, has been here a number of times over the years. He is a very engaging speaker and will be well worth hearing. If you would like some perspective on other things happening at School, please join me and the Division Heads for conversation at our Heads Forum on Monday, November 5 at 8:30 a.m. in Beechwood. If you come, you will hear from a number of students about some of the things they have been involved in this fall. It should be worthwhile and fun. With so much going on, we must be careful to take some time to slow down and enjoy those around us. In turn, it will be refreshing, rewarding, and enjoyable to use Thanksgiving as a point of reflection and growth. Although I’ll speak more to it as we approach the end of November, I’m grateful for all that you’ll do to help us celebrate our past, enjoy our present, and make our future one of excellence. I hope you enjoy Halloween. Try not to consume too much candy. P.S. – I can’t help but smile about the wonderful Halloween events in School today. Students and colleagues alike were energetic and enthusiastic. The costumes were really impressive. 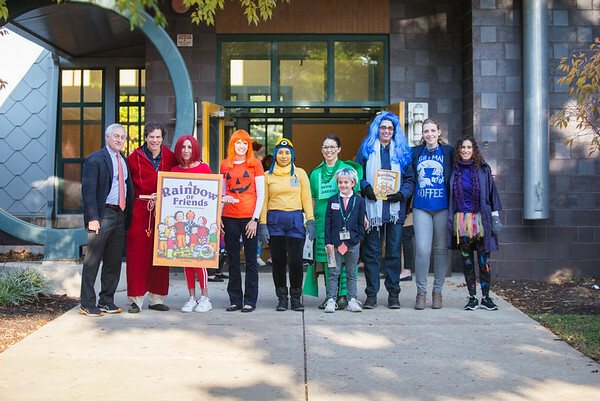 I must admit that while I enjoyed all of them, I was especially taken by the members of the Lower School who represented the characters from my favorite children’s book, A Rainbow of Friends. A special thanks to Lower School student Kate Ulrich who did a wonderful job dressing as me. Although her hair needed to be grayer, I had no doubt who she was.